Sorry for the delay in the monthly update, I was waiting for the Q3 data to arrive. After reading and re-reading Compass Q3 report, Bloomberg's, The New York Times, StreetEasy and Miller Samuel by Johnathan Miller. 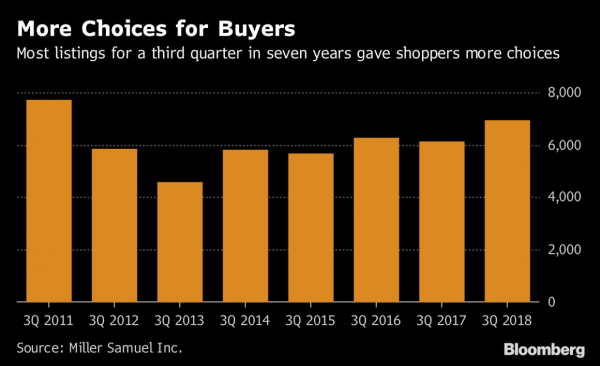 Rather than giving you a long drawn out explanation of the current state of the Manhattan markets, I'll just sum it up in two easy-to-read charts by Bloomberg (below) entitled, "More Pain for Sellers and More Choices for Buyers."